This booklet is designed to provide examples of the types of solutions and task design ideas that you can use to reduce exposure to risk factors for musculoskeletal disorders and slips, trips, and falls. Although the ideas in this booklet are not an exhaustive list, they can be used as a foundation for developing similar types of solutions. One of the largest categories of injuries in mining is musculoskeletal disorders (MSDs), and a significant contributor to these MSDs and other mining injuries are slips, trips, and falls (STFs). MSDs and STFs can be prevented by identifying risk factors and reducing exposure to these risk factors through ergonomics. Ergonomics is the science of designing tools, tasks, equipment, and the work environment so that job demands do not exceed the capabilities or limitations of the majority of the workforce (preferably, at least 95%). Properly designed work tasks can lead to safer and more efficient performance of your workers. This is especially true in mining, which is characterized by physically demanding work carried out in a range of dynamic environments. 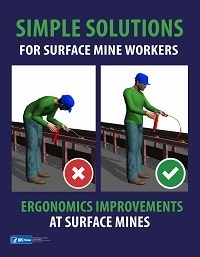 Most mines (and maybe your own mine) may not have dedicated personnel for addressing ergonomic issues. However, this should not prevent you from making ergonomics improvements. The National Institute for Occupational Safety and Health (NIOSH) has developed a range of tools to assist you with addressing ergonomics needs at your mining operations, including training to teach workers how to recognize and report risk factors for MSDs, guidelines for implementing an ergonomics process, and ergonomics audits for several types of operations. Many of these tools can be implemented by observing work habits and taking fairly simple measurements. Once deficiencies are noted, you can help workers to redesign the tasks to eliminate or reduce the hazards.